Shameless Plug: Just in time for Halloween, the Ninja's scary young ADULT novel All Together Now: A Zombie Story is available today only for free download on Amazon until midnight. But seriously, that story's messed up, so don't let little kids read it. First Paragraph: IT ALL STARTED WITH A FIELD TRIP. AND BEFORE you start expecting stuff about Greek gods or me being bitten by a spider that turned me into some kind of superhero—sorry to disappoint you. This isn’t one of those stories. At least my field trip wasn’t to a museum, but it wasn’t anywhere cool like Universal Studios either. I go to Lompoc Middle School in California, where expectations are high, but the budget is low. So for our field trip, we went to a chicken farm. Which actually turned out to change my life. What a great opening paragraph that is, Esteemed Reader. I could spend the whole review talking about it (don't worry, I won't). It hooks the reader in the last sentence with a straight throat grab. Less subtle openings get set aside:) The reader has to wonder how a trip to a chicken farm can change someone's life. But more important than establishing setting, which Bradley does, smoothly, this opening paragraph establishes tone (and possibly voice, though the way editors talk about voice sometimes, I'm not sure I know what voice is anymore or if I ever did). F.T. Bradley has been a long time Esteemed Reader of this blog and I take great pleasure in reviewing her book, the same pleasure I'll take in reviewing your book when it's ready, Esteemed Reader. 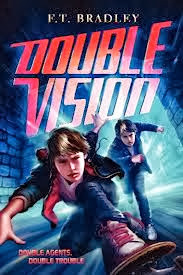 She's my Facebook homie and her new book, Code Name711, the sequel to Double Vision comes out Tuesday. You should go ahead and pre-order it now (if I'm going to shamelessly plug, I should at least include a link to buy the author's book--that's two links!). One of the chickens made a noise and pooped. Then another did the same: chirp, then poop. Chirp, poop. Mom had just come off her shift when we got home around one, and she was waiting in my room, ready to let me have it. I’ll save you the whole Linc-Is-in-Trouble-Again speech, because if you’ve ever been in trouble, you know what those sound like. 1. I was grounded for the rest of the year (it was November, but still). 2. No TV, even though all these new shows are on (an argument that fell on deaf ears with Mom). 3. No skateboarding (my sole mode of transportation). Not that it mattered—see number one. 4. No going over to Daryl’s, who has an Xbox, unlike me. So no video games, even if I just got to level five on Racing Mania Seven (another argument that fell on deaf ears). Now, this is what you would call an impossible dilemma. Right? I agree to this, and my family’s troubles will be taken care of, but I would put my life in danger. I don’t do this, the Bakers might be bankrupt and homeless. My two favorite things about Double Vision are Bradley's pace and tone. This book moves as fast as Dan Gutman's The Genius Files series, which is perfect for the book's target audience. The twists and turns come fast and Bradley stays one step ahead of the reader to the end. There's an evil Mona Lisa painting (it's complicated) and a whole lot of action and gadgets, which is always an unbeatable combination. Now, I know you must be bored with this guy already—I know I was. I’ll give you a quick recap so we can get to the part where I get my first taste of junior agent life and things get interesting. A book in which an ordinary boy suddenly becomes a world traveling agent requires no small amount of exposition, but younger readers don't care. They want action and they want humor. Bradley gives them plenty of both. By having Linc skip the boring parts, she not only picks up the pace, but further establishes character and tone. Here's my favorite chapter ending/opening combination. But otherwise, this secret agent training was pretty dull—I mean you’re bored just reading this, right? So I’ll fast-forward to the next day: Monday morning, 7 a.m. That’s when Agent Fullerton showed up at my hotel room just as I was messing up on Henry’s latest who-is-Benjamin-Green quiz. “Time to go,” was all Fullerton said. And that’s when things got dangerous. Fast. OKAY, SO MAYBE IT DIDN’T GET DANGEROUS immediately. First, we had to pack, then there was a really long cab ride to the airport, and after that we had to go through security—you get the idea. Daryl jumped up next to me. “Yes, ma’am.” He saluted Mrs. Valdez. Daryl is the kind of guy who always acts like he’s had one bowl of Lucky Charms too many for breakfast. IF THIS WERE A MOVIE, NOW WOULD BE the part where they play some pumped-up tune, showing me running, sweating, and learning all about Benjamin Green while guzzling energy drinks. But as you’ve probably figured out by now, this isn’t your typical action-hero story. We guzzled orange juice instead of power drinks and ordered room service, too: big stacks of pancakes with extra syrup. Then with a sharp left, he took an alleyway, making us bounce on the cobblestones. The alley was so narrow, it was a miracle Guillaume didn’t lose his side mirrors. A sharp turn made the tires squeal, and I was pretty sure we tipped onto the two right wheels for a second there.